Harvard report finds immigration, other demographic trends will fuel housing demand over the next decade. NEW YORK (CNNMoney.com) -- The current housing market is bleak: home prices and sales are plummeting, foreclosure proceedings are skyrocketing and mortgage rates are on the rise. Social trends - people getting married later and divorced more often - are making single-person households the fastest growing household type, the study finds. In addition, a long-term net increase in potential home buyers will be driven by demographic factors: the aging of "echo boomers" into adulthood, an increased life expectancy for baby boomers and projected annual immigration of 1.2 million. Still, before the housing market can turn around, it must first work off the record numbers of unsold homes on the market. From 2005 to 2007, the number of new and existing vacant homes for sale rose 46% to 2.12 million. The nationwide glut of unsold homes has hit the real estate market hard, forcing down sale prices, stemming new construction and leaving millions of homeowners with properties worth less than the value of their mortgage. In early 2008, the nation had an 11-month supply of unsold new homes and a 10.7-month supply of existing single-family homes, according to the Harvard study. A six-month supply of existing homes is considered a buyers' market. Reducing the current supply will require price declines, a decrease in interest rates, employment growth, a return of consumer confidence and the revival of accessible mortgage credit. A reduction in new home construction is another key to decreasing inventory, Retsinas said. Privately owned housing starts fell 3.3% to a seasonally adjusted annual rate of 975,000 in May from 1 million in April, according to the Commerce Department. A sharp drop-off in housing starts has precipitated housing turnarounds in previous bubble-bust cycles, said Karl Case, a Wellesley College economics professor and a co-founder of real estate consulting firm Fiserv CSW. Case also sees long-term growth in the housing market and agrees that immigration and other demographic trends will help fuel a long-term recovery. 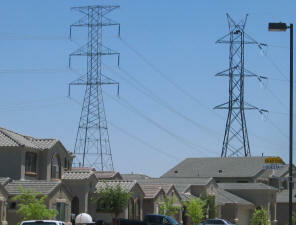 "If household formation continues at pace, prices will recover and starts will rise again," Case said. In the housing bust of the early 1990s, cities with big immigrant populations, like Los Angeles, recovered more quickly than other metropolitan areas, like Boston, with lower foreign-born, said Case. "Not all immigrants buy houses, but many immigrants buy houses," Case said. "That has a positive effect on the prices in a market." 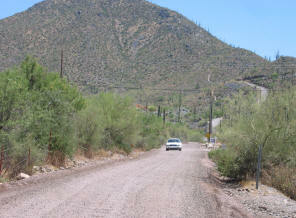 Federal officials are putting the squeeze on rural Arizona communities to pave over dirt streets and parking lots to reduce airborne pollutants and shrink the Valley's brown cloud. This doesn't sit well with many Cave Creekers who don't like the fact that their town leaders have approved an ordinance encouraging the paving plea. They love their dirt roads. One prominent citizen is even circulating petitions for a vote to have the town ordinance overthrown. 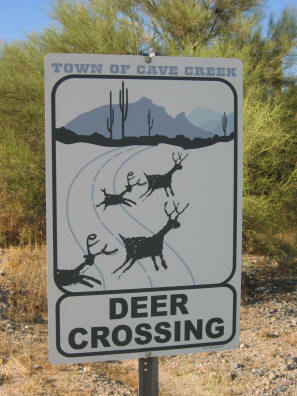 The mayor of Cave Creek was quoted in the Arizona Republic saying it's unfair to mandate these ant-pollution measures in a town with some many horses. "The horses can't ride on asphalt" Mayor Vincent Francia was quoted as saying. Some have even fired off letters to the EPA, asking that the town be exempt from such regulations. Years ago, in neighboring Carefree, residents along rural Celestial Drive, one of the few areas of horse properties in Carefree, voted not to have to town pave over the road, in order to maintain the areas rural character. Sales of existing homes in May hit the highest point since last summer, marking a continued uptick in buyer activity since the beginning of the year. Some 4,265 traditional sales were recorded last month, according to an Arizona State University study. Non-foreclosure sales in May were at the highest level since 4,570 sales were reported in June 2007, the report shows. Falling prices have helped stoke renewed interest from traditional buyers and investors looking to take advantage of hefty discounts on foreclosure properties. “The lower median price is being impacted by several forces, including the large number of vacant homes, especially in certain neighborhoods,” ASU Realty Studies director Jay Butler stated in the report. 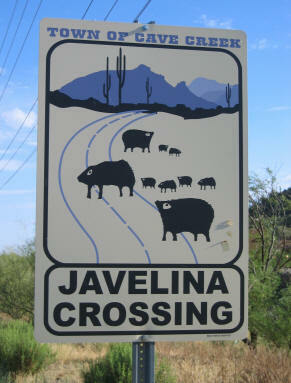 Careful when driving around Cave Creek! You can't say you weren't warned by these novel signs! 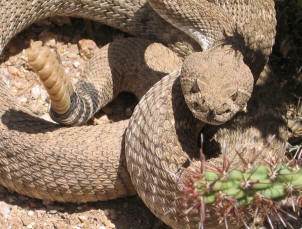 Coming Soon: Is rattlesnake venom becoming stronger? There's a huge debate on among Arizona experts. Learn why they are suggesting this next month. Sun, golf - and prices in some communities dropping 20% to 30%. When it comes to attracting retirees, Arizona ranks second in the nation, having overtaken California in 2000. And real estate values have reflected its popularity: As recently as 2006, condo prices rose 15% over the previous year. But retiree inflows haven't managed to insulate the local real estate market from the shakeout. In fact, Phoenix seems to be accelerating into the downturn, with much of its dropoff taking place in the past few months. Economy.com shows its real estate values falling almost 8% over the past year, and its foreclosure rate has nearly tripled since 2007, according to research firm RealtyTrac. For the real deals, though, stay away from the city center, where values have held up better, according to Jay Butler, director of realty studies at Arizona State University. Instead, look to the planned communities that surround Phoenix, which are magnets for retirees and are dropping more to the tune of 20% to 30%. A $1 million home at the market's apex might go for the mid-700,000’s now, Butler estimates. Look to areas like Sun City Anthem, Palm Valley, and Avondale for solid housing stock at reasonable prices. Some adult-oriented communities have sweetened the pot: Sun City Anthem has a 48,000-square-foot recreation center with pool and spa, as well as the ASU Lifelong Learning Academy, an adult-education offshoot of the university. Are the links, not the books, more your thing? Phoenix's Maricopa County has 158 golf courses, the most of any county in the country. Quiz Answer: Who's the winner and who's the loser as the tarantula spider meets the tarantula wasp? Answer: The tarantula wasp! In a battle that plays out regularly in the Arizona desert, the wasp is capable of paralyzing the spider and dragging it back to it's nest to provide a place to lay it's eggs! The Myth of the $ 80 house! Are some new homes netting the builder THAT little? Yes, and I have it on authority of a local homebuilder! In some of the entry level homes in the least expensive places to buy a home in the valley, ie: Surprise and Gilbert, some spec homes by new homebuilders are only earning the builder $ 80 profit! The builder told me anonymously that they are amazed when young couples make an offer on the homes and want $ 15,000 or $ 20,000 in extras, since they've read in the media about the plight of new home builders. But in reality, the builders are just trying to keep their crews busy, fearing that if they shut down the project, they'll leave for better places and won't be available when they need to start up construction again. On another issue, it amazes me where some of the new homes are being built. I snapped a photo the other day of an area that in my opinion, may be the worst I've seen. Imagine homes being built below a dam, in the middle of a labyrinth of high power lines, and near the approach and departure paths of one of the state's busiest airports? Check the photo below. That's why you need a Realtor who will guide you around some potential problems. Catherine Reagor, On Real Estate, from the Arizona Republic. The housing market continues to search for a bottom as foreclosures continue to climb across metropolitan Phoenix. In May, 3,402 homes across Maricopa County went into foreclosure, according to the Information Market. Almost all of those homes went back to lenders. May's foreclosure figure is up from the 2,969 foreclosures or trustee deed sales, filed in April. Don't expect foreclosures to slow this month either. The number of pre-foreclosures, or notice of trustee sales filed, also climbed in May. Last month, there were 6,384 pre-foreclosures filed in Maricopa County, compared with 6,143 in April.